Dysfunction in neuronal transport mechanism linked to Alzheimer’s disease. Alzheimer’s disease is a neurodegenerative disorder characterized by progressive memory loss and cognitive dysfunction. It affects more than 30 million people worldwide, including an estimated 5.4 million Americans. One in 10 persons over the age of 65 has AD; one in three over the age of 85. There are currently no treatments proven to cure or reduce the progression of AD. Now, a study from researchers at University of California San Diego confirms that a mutation-caused dysfunction, in a process cells use to transport molecules within the cell, plays a role in promoting the heritable form of Alzheimer’s disease (AD). The team state that their results further illuminate the complex processes involved in the degradation and decline of neurons, which is, of course, the essential characteristic and cause of AD. The opensource study is published in the journal Cell Reports. Previous studies show that genetically, AD is divided into two groups; the much more common sporadic form of the disease in which the underlying primary cause is not known and the rarer familial form, produced by inherited genetic mutations. In both forms, the brains of AD patients feature accumulations of protein plaques and neurofibrillary tangles that lead to neuronal impairment and eventual cell death. There has been some evidence of another disease-driver, namely, defects in endocytic trafficking, the process by which cells package large, external molecules into vesicles or membrane-bound sacs for transport into the cell for a variety of reasons or uses. The current study confirms previous results that endocytosis is affected in AD and extend these to uncover a neuron-specific defect. The current study analyzes neurons created from induced pluripotent stem cells in which they generated PS1 and APP mutations characteristic of familial form using the emerging genome editing technologies. In this ‘disease-in-a-dish’ approach, the lab observed that the mutated neurons displayed altered distribution and trafficking of APP and internalized lipoproteins, proteins that combine with or transport fat and other lipids in blood plasma. Results show that there were elevated levels of APP in the soma or cell body while levels were reduced in the neuronal axons. Data findings show that a common early defect among familial form APP mutations, is APP accumulation-induced impairment of a key neuron-specific traffic pathway, soma-to-axon transcytosis, caused by defects in the recycling endosome. Results show that treating mutated familial form neurons with a beta-secretase inhibitor rescued both endocytosis and molecule movement within the cell functions. The researchers note that epidemiologic evidence implicating cholesterol as a major player in AD also dovetails with these molecular and cellular findings. The team surmise their findings show that impaired endocytosis and molecule movement within the cell are present in multiple types of familial form mutations, and that together they define an apparent defect in the Rab11 recycling endosome. For the future, the researchers state that the defects reported occur in the absence of overexpression of any of the proteins involved and, thus, may accurately reflect the earliest changes from normal behaviour generated by the familial form of Alzheimer’s disease. 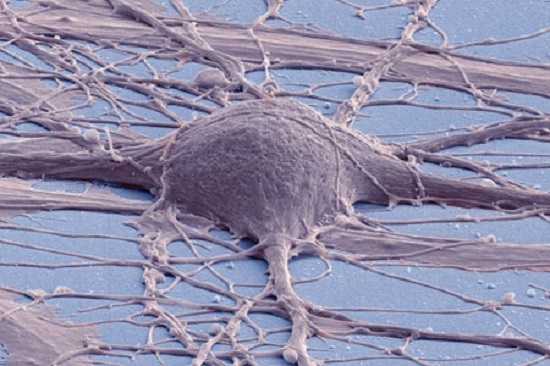 This is a colorized scanning electron micrograph of a human induced pluripotent stem cell-derived neuron in culture. Credit: Thomas Deerinck, National Center for Microscopy and Imaging Research, UC San Diego.